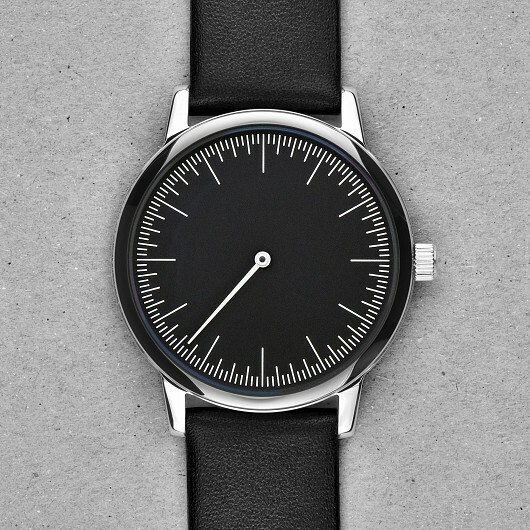 to development, production, communication and watchmaking – are carried out personally by 33-year-old Designer and Managing Director Raphael Ickler. 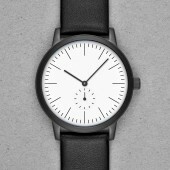 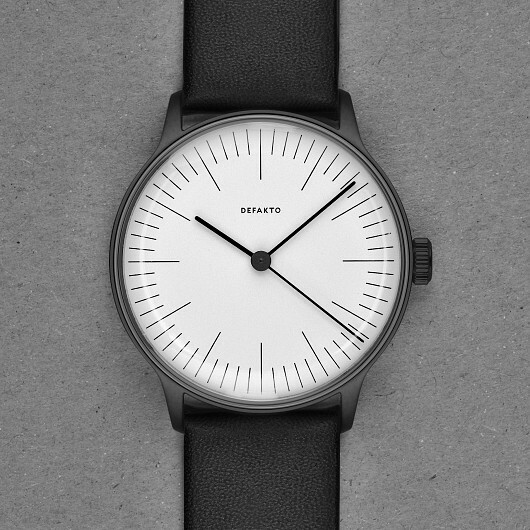 This level of personal attention produces stringent, honest watches, emphasizing an aesthetic of unique minimalism and sustainable, regional fabrication. 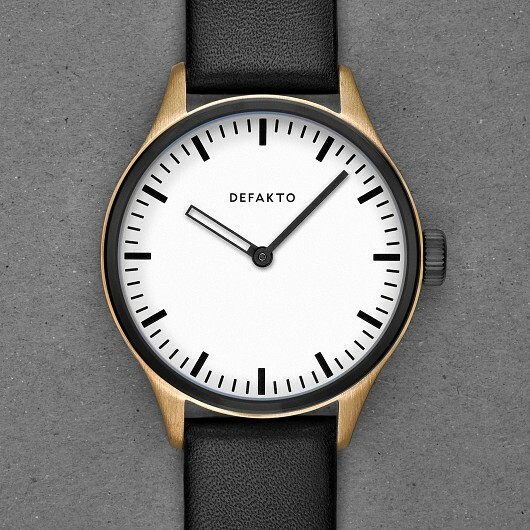 Defakto is also a member of the "Deutscher Werkbund" – an institution founded in 1907 by Peter Behrens – the "Wiener Werkstätten", as well as other collectives of craftsmen and professionals. 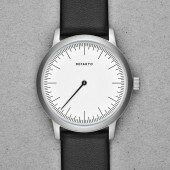 The Deutscher Werkbund is an "association of artists, architects, entrepreneurs and experts" with a long history of innovation that gave rise to the Bauhaus movement. 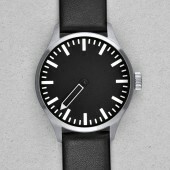 It remains a key initiator in the fields of modern architecture and industrial design to this day. The unisex Defakto Vektor builds a bridge between classical 1950s design and modern minimalist aesthetics. 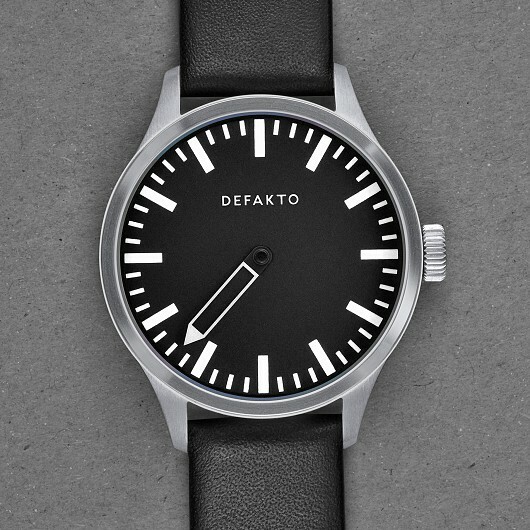 It offers a retro-futuristic design embodied by the typic plexiglas sphere and its convex dial circumnavigated by manually shaped hands. 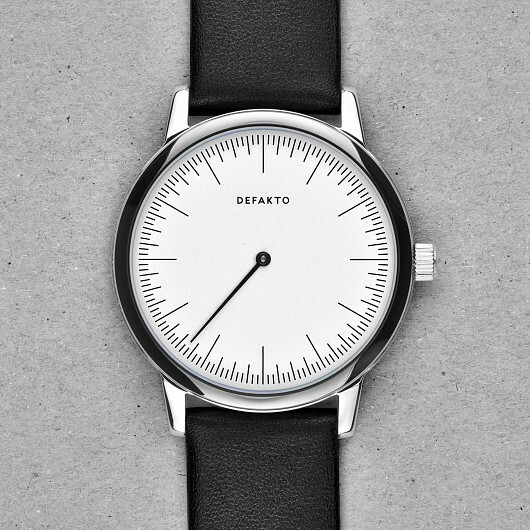 The finely drawn indexation and the thin, rounded hands with disc-like hearts make up the modern, puristic character of the Defakto Vektor. 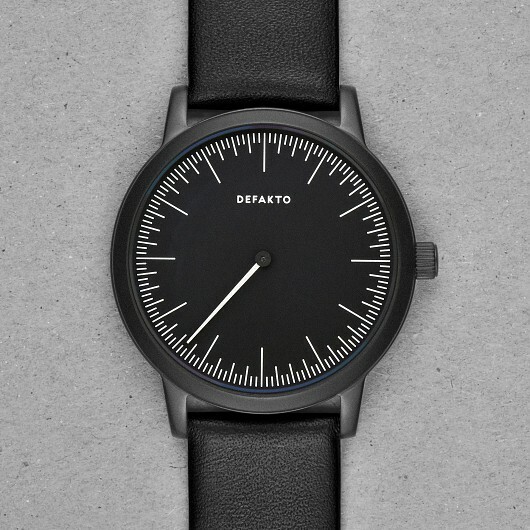 The two-handed Defakto Akkord is a striking, slightly brutalist aesthetic statement. 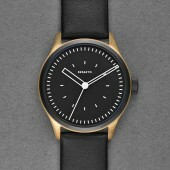 It is available in both stainless steel and bronze case versions. 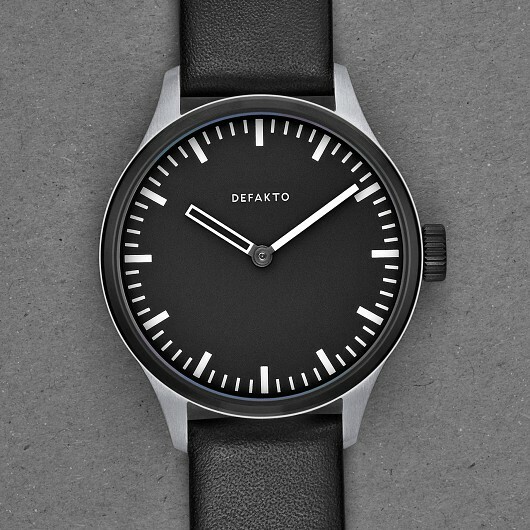 The interplay of the contrast-rich materials and the strikingly scaled dial in black or white sets a contemporary note and provides high readability. 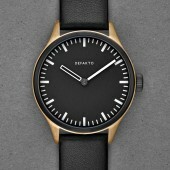 The Modular version of this well-balanced, characterful watch has been honored with the German Design Award. 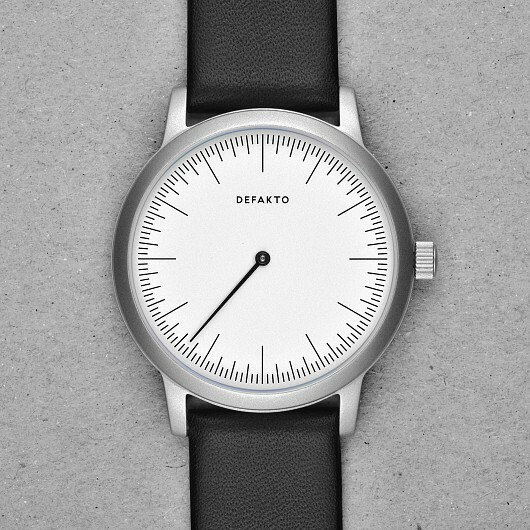 The integrated, minimalist design of the Defakto Kinetik aims to visually emphasize the interaction of its skeletonized watch hands and the resulting geometrical constellations. 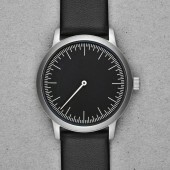 The separate hour and minute indexes are framed by the watch hands as they pass above, allowing perfect readability. 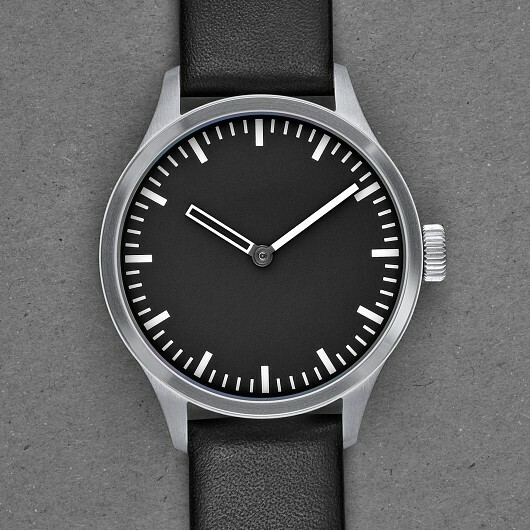 Available with a black and white dial as well as a stainless steel watch case with a brushed or PVD-coated surface. 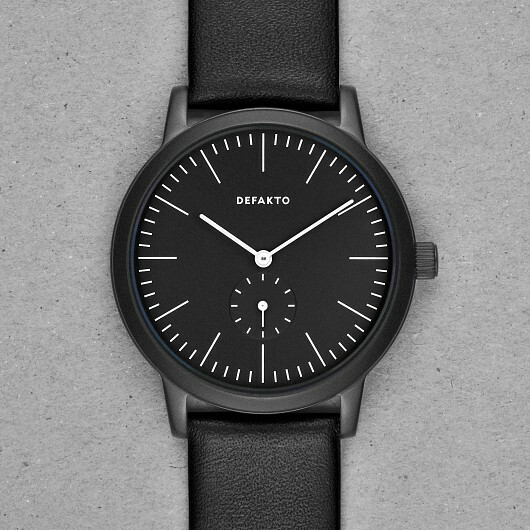 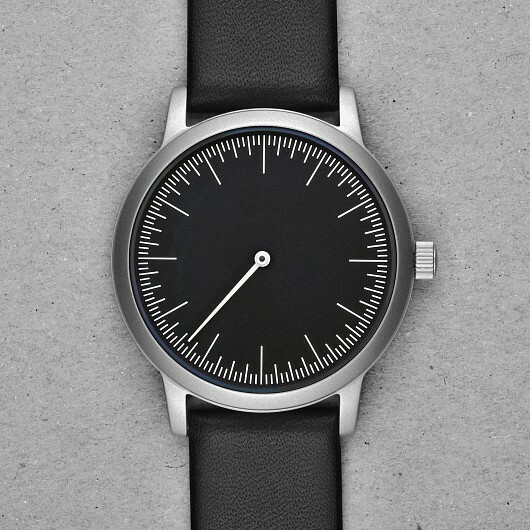 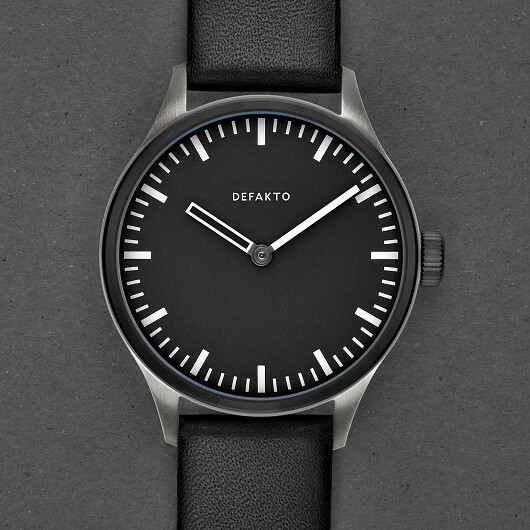 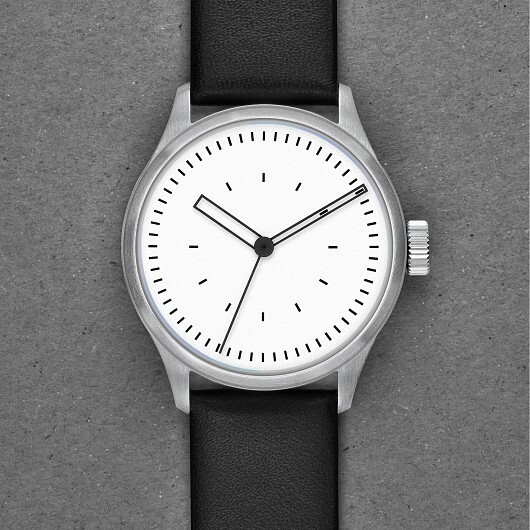 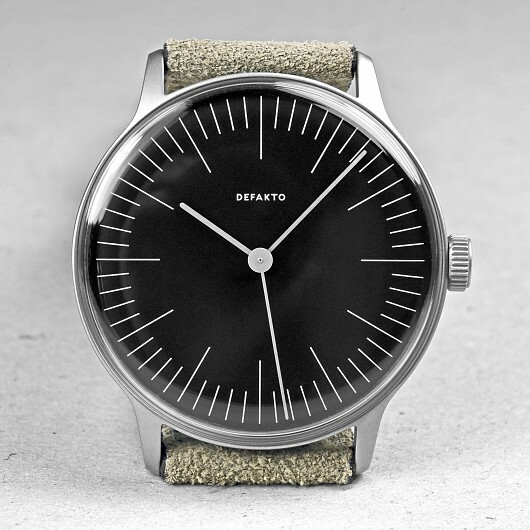 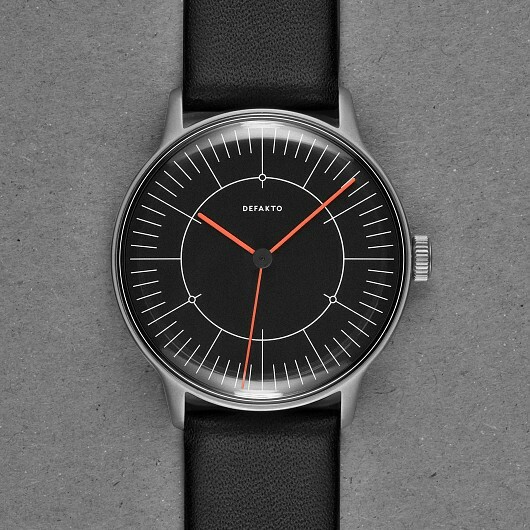 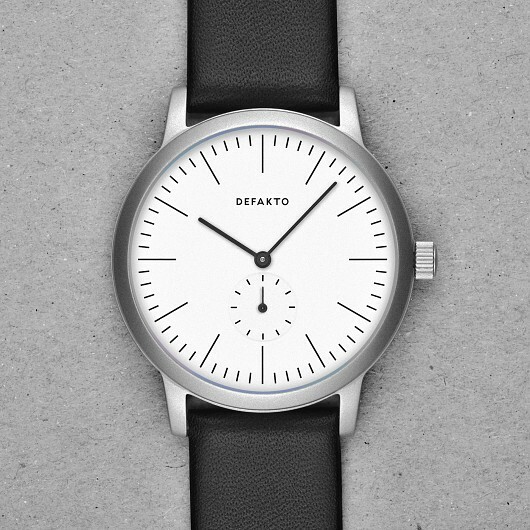 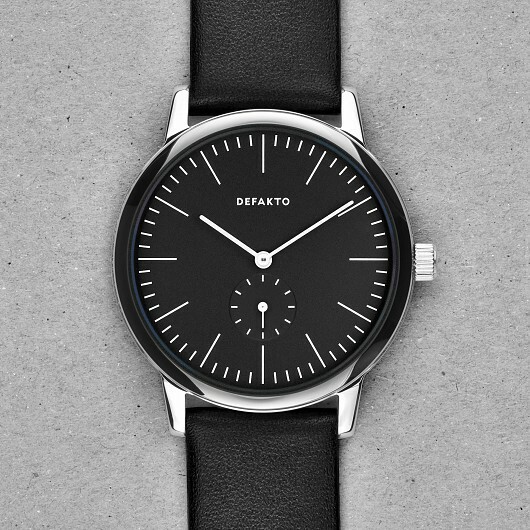 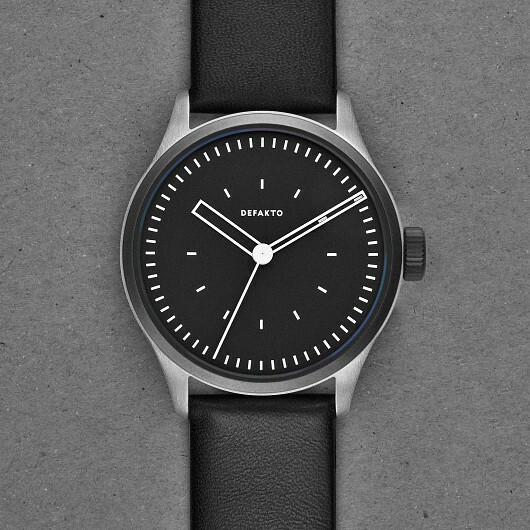 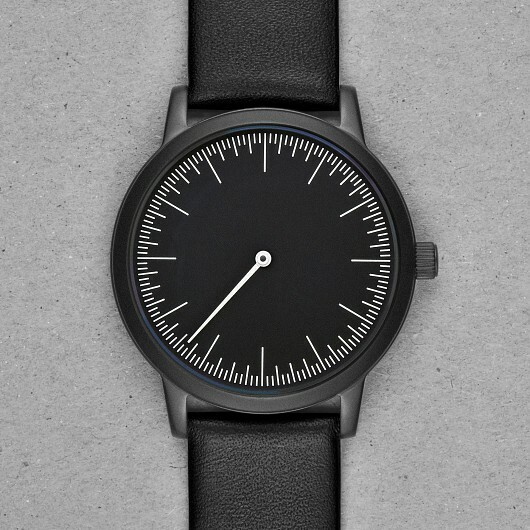 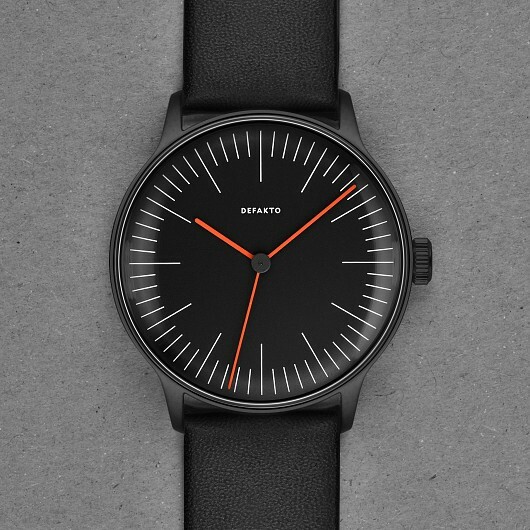 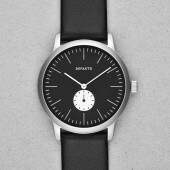 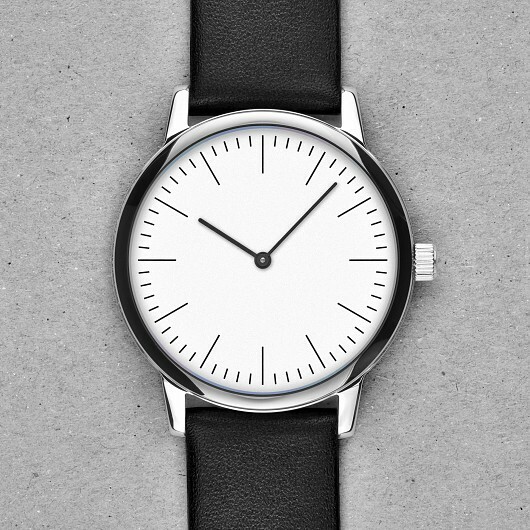 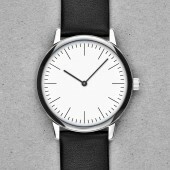 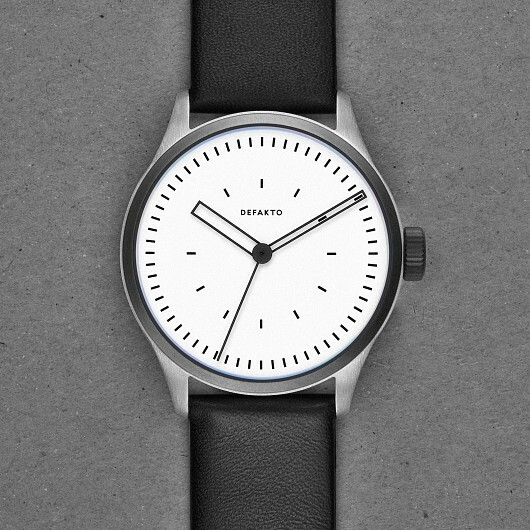 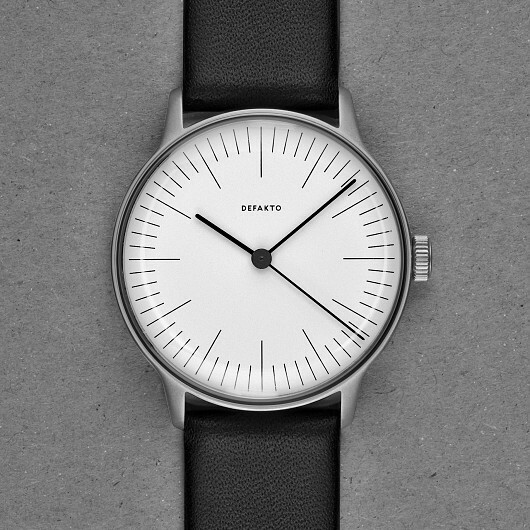 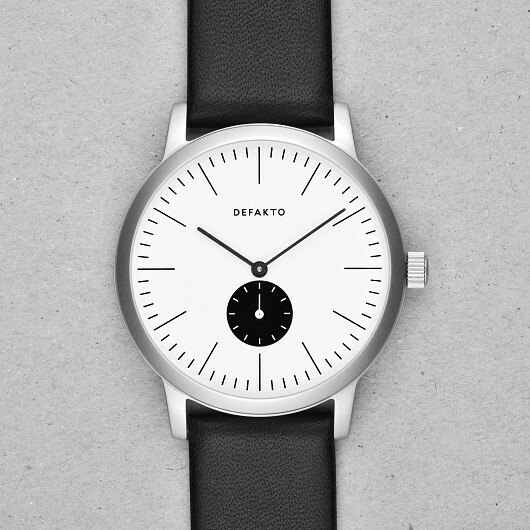 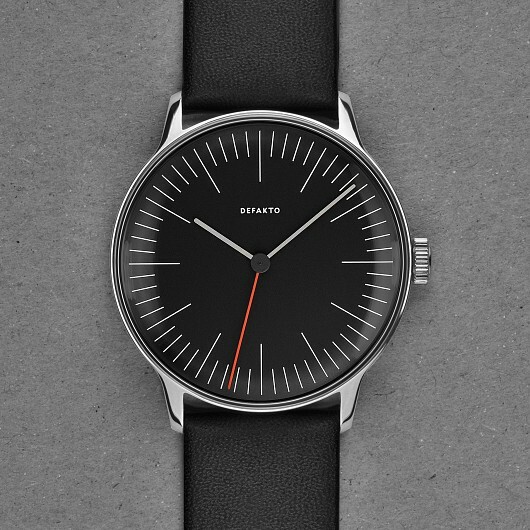 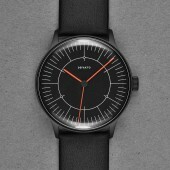 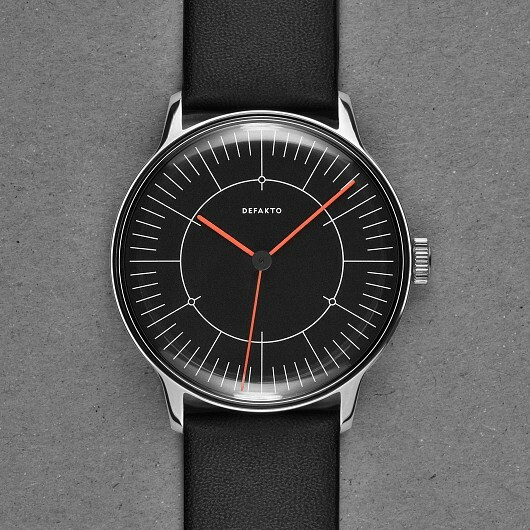 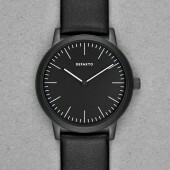 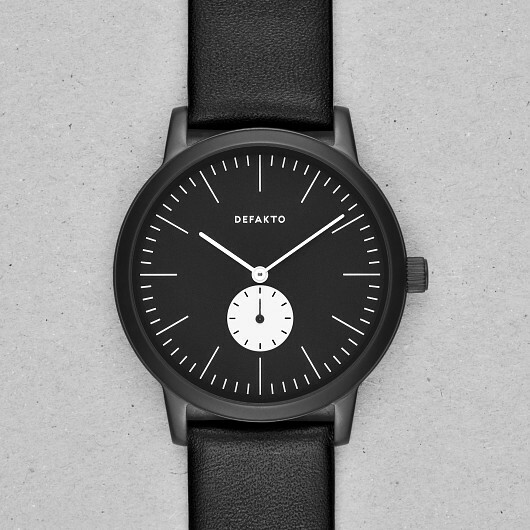 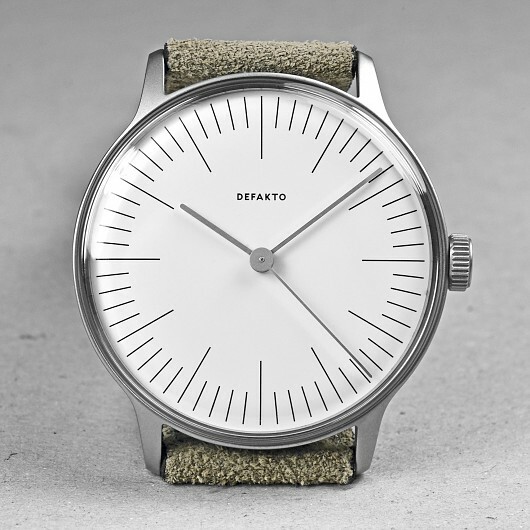 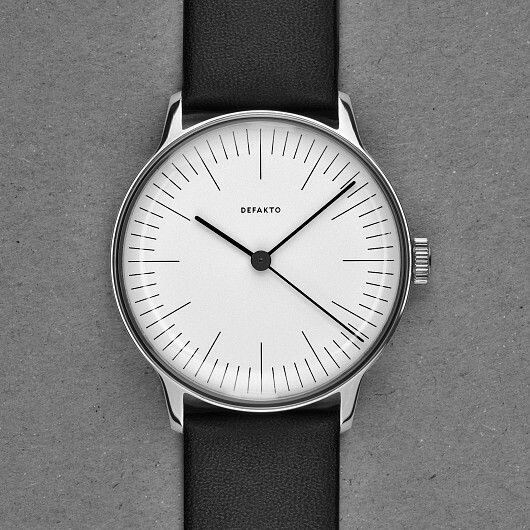 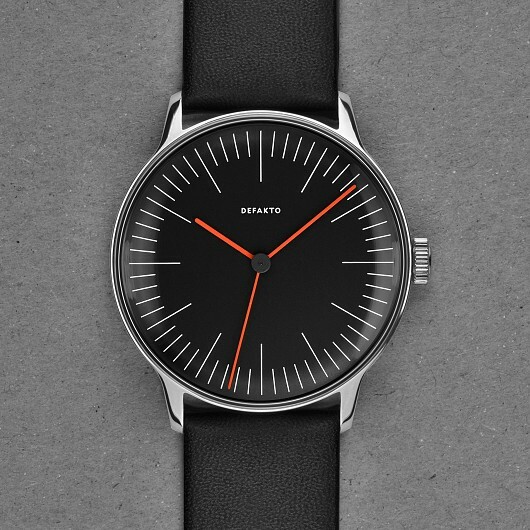 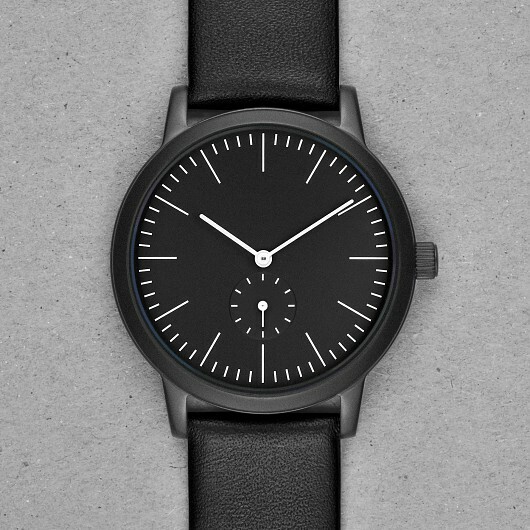 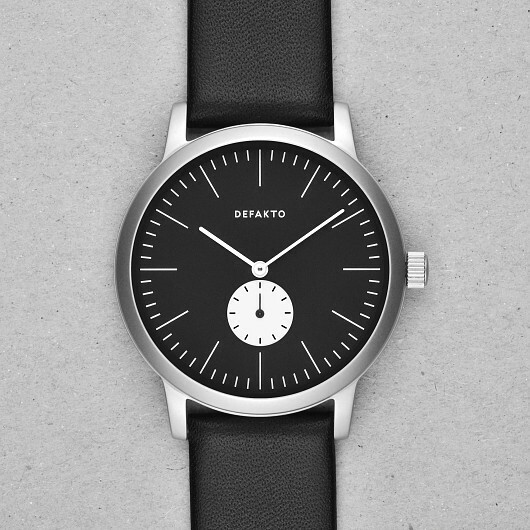 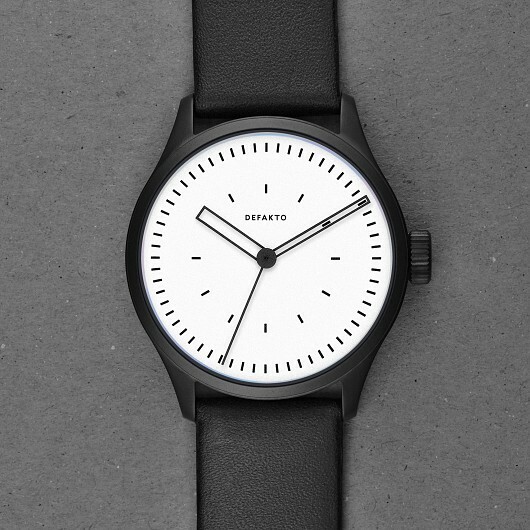 The Defakto Eins is the only minimalist one-hand watch that will turn heads. 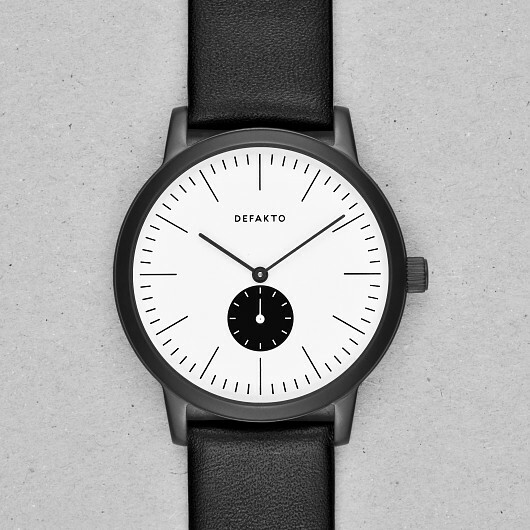 Its puristic dial and the single skeleton hand make a unique statement - one that says you live at your own pace. 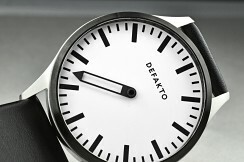 On the Defakto Eins, time is read in intervals rather than moments, as the indexes represent only the hour and quarter-hour periods exclusively. The singular large hand is simultaneously used to tell the hour and approximate minute. 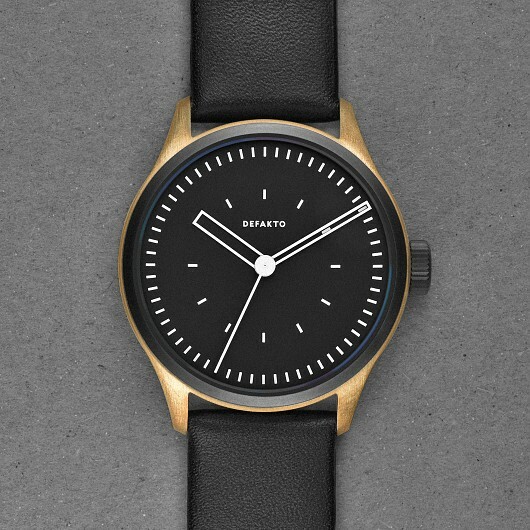 This watch will sharpen your intuition. The super-minimal, one-hand watch Defakto Mono comes with a five-minute scaled dial and a very flat 6.6 mm stainless steel case. 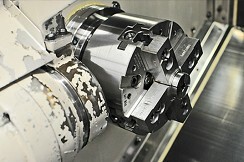 All indexes have the same lineweight and double their length at each step from 5 to 15 to 60 minute intervals. 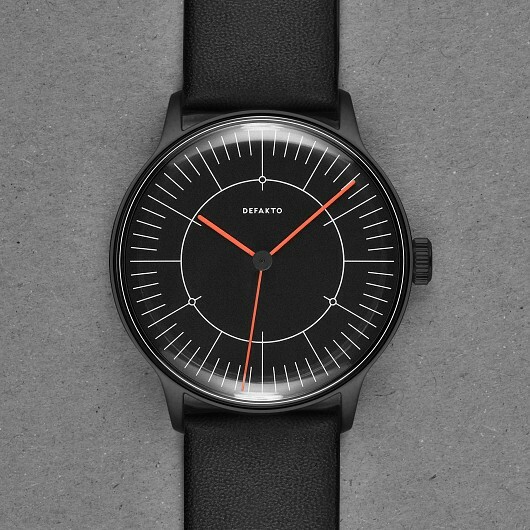 In combination with the matching needle-like hand, this is a watch for minimalists who like the idea of understatement and unconventional time concepts. 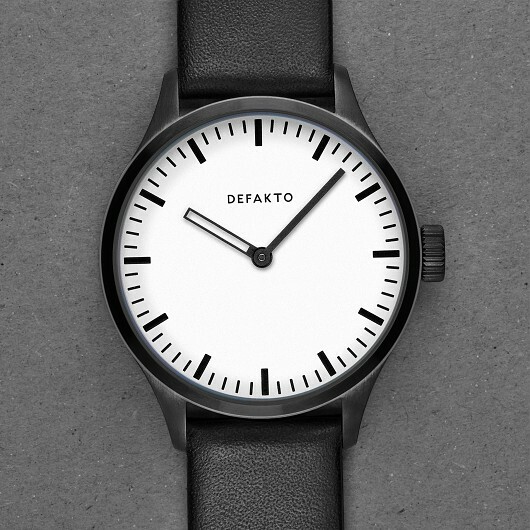 The puristic two-hand watch Defakto Dialog is characterized by its understated aesthetics. 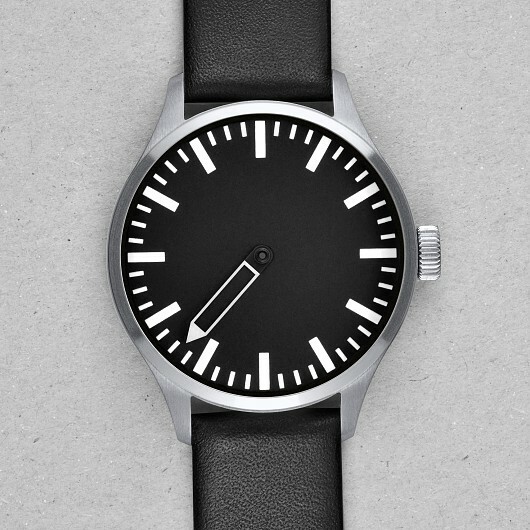 Its very flat 6.6 mm stainless steel case is available with a high-polished or black PVD surface. The Dialog looks simple at first sight but offers powerful design concept in its details. The characteristic and finely drawn indexes of the dial and its light, well-balanced and rounded hands give an easy-to-read overview of the time and make up the elegant touch of the watch. 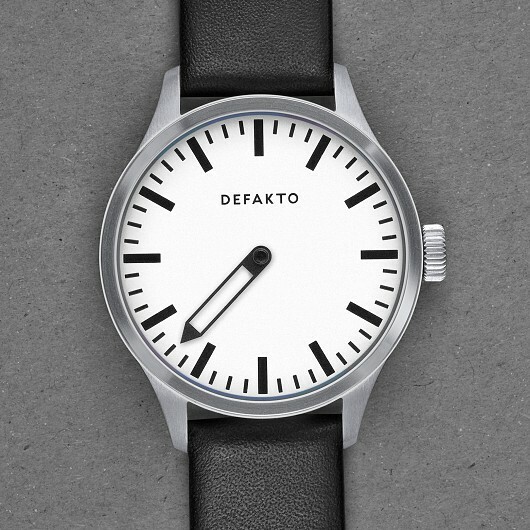 The three-hand watch Defakto Struktur is characterized by its minimal design, its ultra-flat 6.6 mm watch case and its separate second hand. 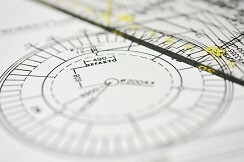 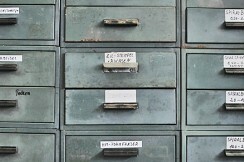 The fine indexations are drawn with identical line-weights to achieve a pure and balanced design. This is supported by the light, rounded hands that add extra character to the watch. 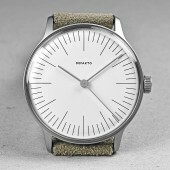 The separate second hand ensures accurate reading and adds a certain liveliness of detail to the puristic watch theme. 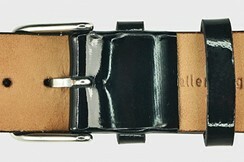 Last years Stille Nacht, the successor of Mitternacht, was sold out within one night. 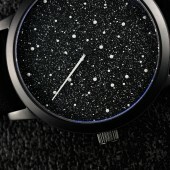 Now the unique art-watch is back again in a second, darker edition that offers a lot of new aspects. 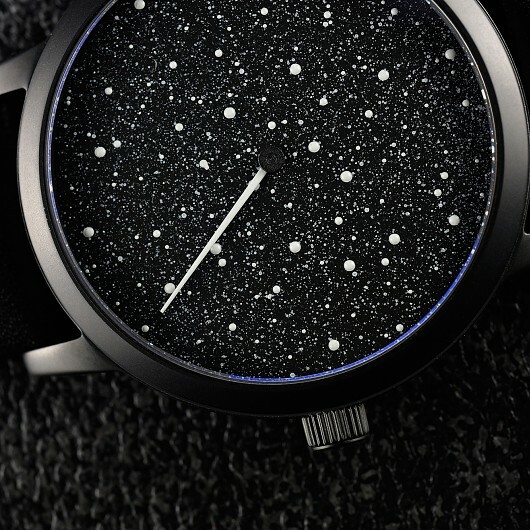 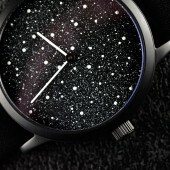 The Mitternacht comes with evolved design and function features such as new fluorescent watch hands and the darker, matt black dial with glowing galaxies and unique, handmade airbrush starfields. 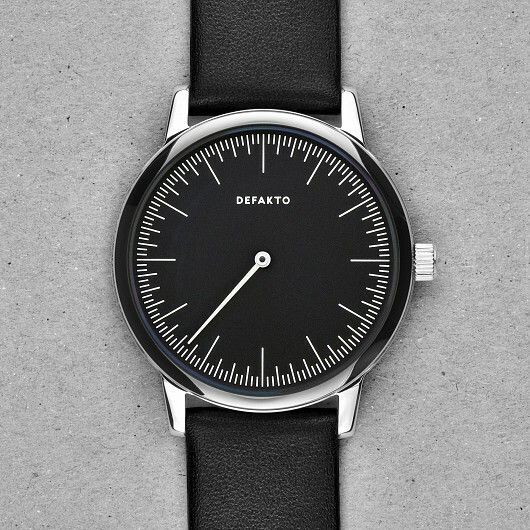 The German made Mitternacht is again available as a one-hand and two-hand version - customizable with no extra charge for left-hand and right-handers. The diversity of manufacturing and craftsmanship in Germany is an integral characteristic of Defakto. 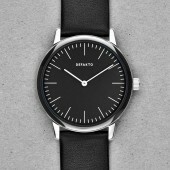 Very few watch brands can offer such high in-house added value. 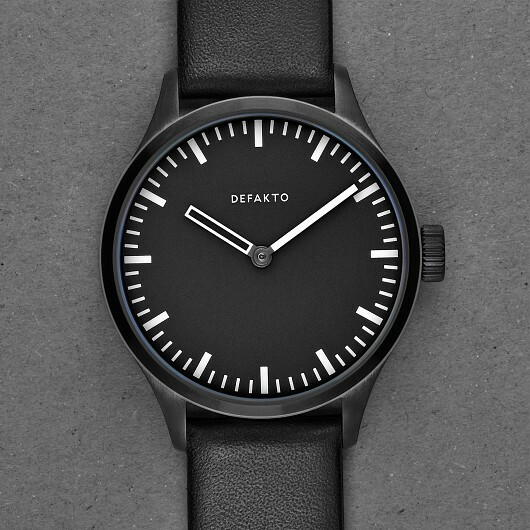 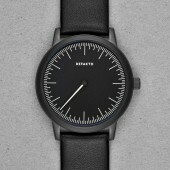 On the design level, all watches of the Defakto collection are products of Bauhaus-inspired contemporary minimal design. 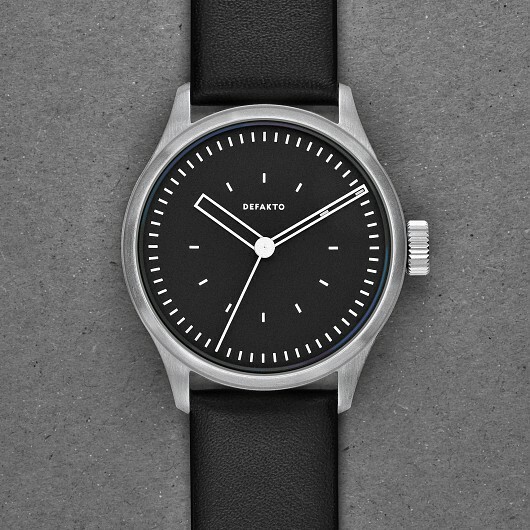 This mindset is built up from the function-driven, high-quality Ickler Manufaktur watch cases, the pure aesthetic of a balanced interplay between hands and dial, and the reliability of precise Swiss and Japanese movements. 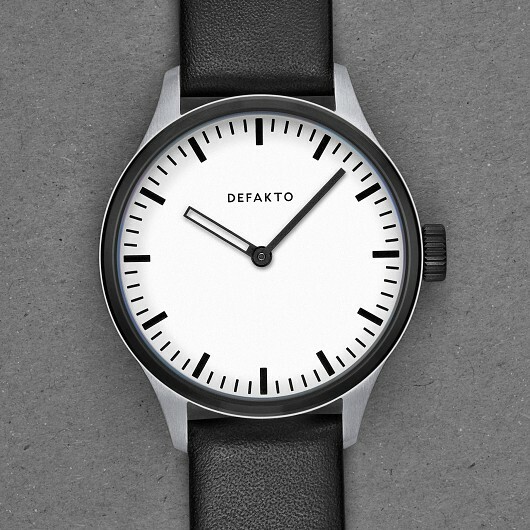 Defakto watches offer advanced design concept aspects on the meta level. 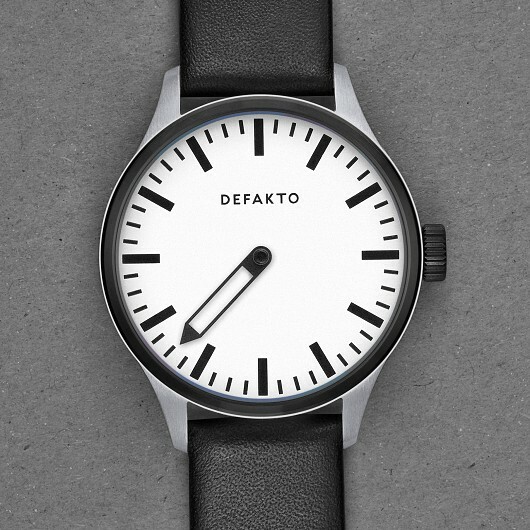 As an example, the Defakto Kinetik’s design is based on the visual emphasis of the geometrical constellations generated by the interaction of the skeletonized hands and the dial components. For the Eins and Mono one-hand watches, fifteen- or five-minute indexes convey a more relaxed experience of time. 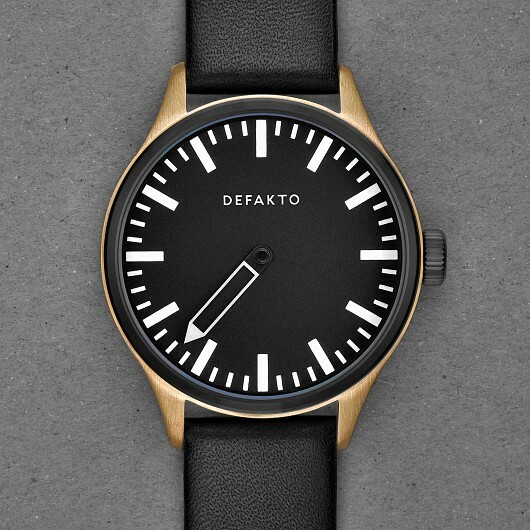 The Defakto watch cases are manufactured from 316L stainless steel or CuSn8 bronze. 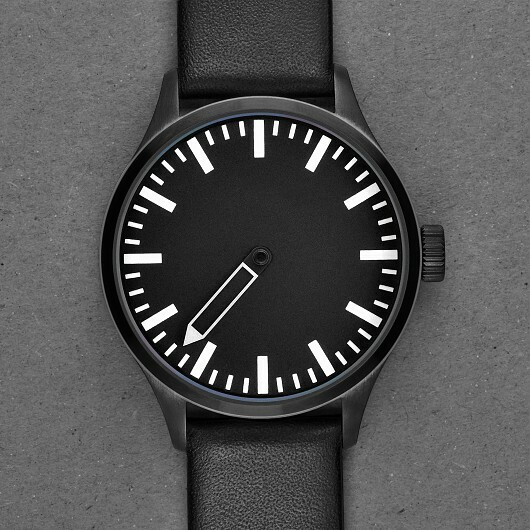 The black coating used on some watchcase surfaces consists of PVD, a highly durable material originally used to harden industrial milling tools. 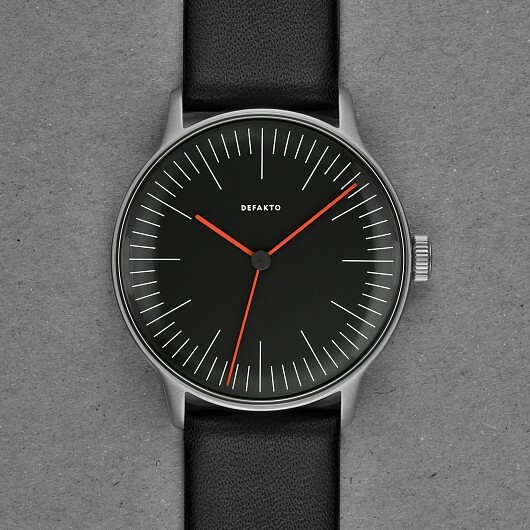 The watches’ high-quality movements are Swiss Made (ETA 2824, Ronda 712, Ronda 6004.D) or Made in Japan (Miyota 9015) and are known for their precision and durability in everyday life. 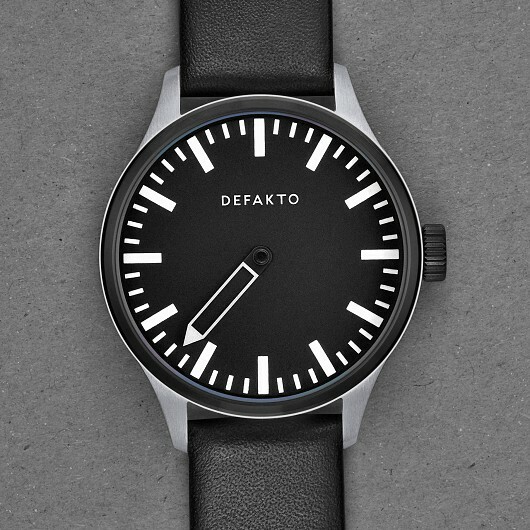 All Defakto watches are available with black or white dials, with a range of material or surface variations, and can be further customized upon customer request. 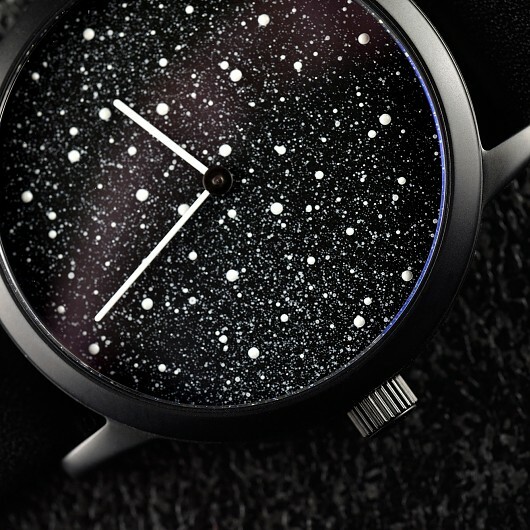 Biodegradable Swiss Made Superluminova is used in watches with luminous components. 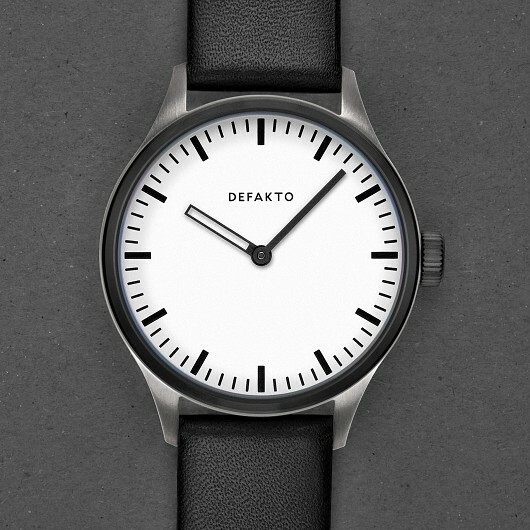 Almost all Defakto wristwatch models are also available without the Defakto logo as the so-called Inkognito versions. 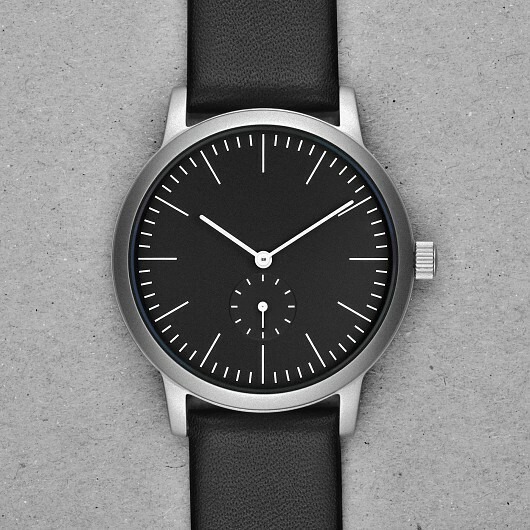 These models can even be built as right- or left-handed watches. All leather straps are handcrafted for Defakto in Bavaria, Germany, from high-quality European cowhide. 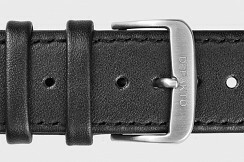 Each bracelet comes with an engraved Defakto buckle, additional or separately-ordered straps are supplied with two spring brackets. All Defakto leather bracelets are designed for arm circumferences from 17 cm to 21.5 cm. 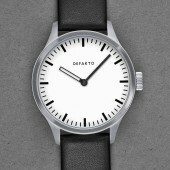 The Defakto Lack leather strap is suitable for small to medium arm dimensions, from 14.5 to 19 cm. 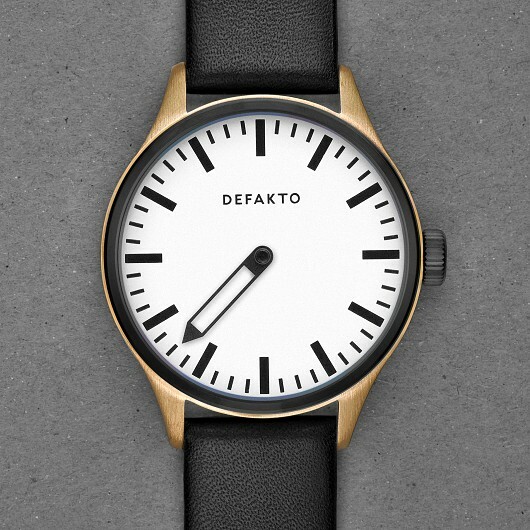 In addition, Defakto watches offer individually adjustable bracelets of non-animal origin. 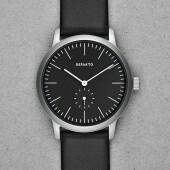 For example, the 100% natural rubber strap or the high quality Perlon or NATO straps. 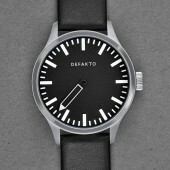 Defakto also offers stainless steel bracelets available in a rough segmented style or as a fine Milanese version. 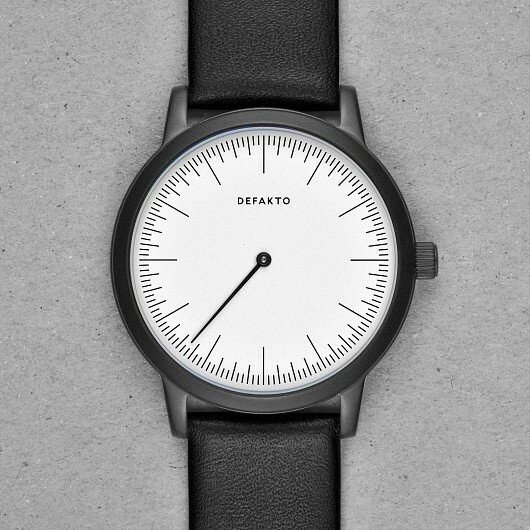 The customizable Defakto straps and bracelets are shipped in their default setting. 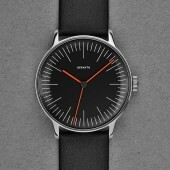 The individual customization is simple. 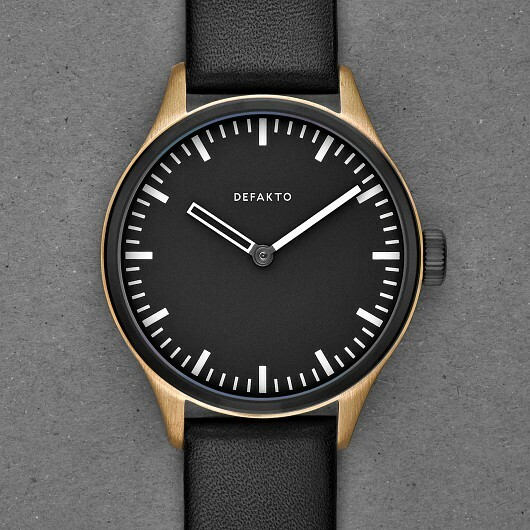 All our mechanical watches are shipped in a German-made box hand-crafted exclusively for Defakto. 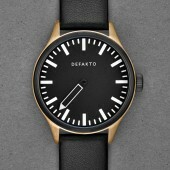 The box is constructed from 100% recycled paper and offers the rough, lively surface of natural cardboard. 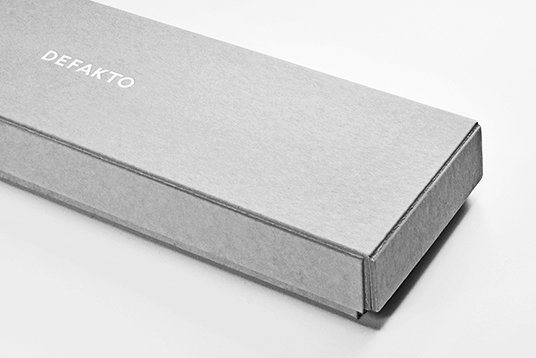 The double-sided bookbinding cardboard, which is laminated to solid 1300 g/m2 weight, makes the Defakto packaging stable while being haptically and optically elegant. 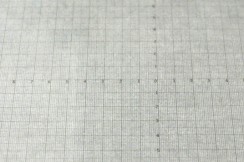 Each box is processed from a single piece of laminated cardboard. 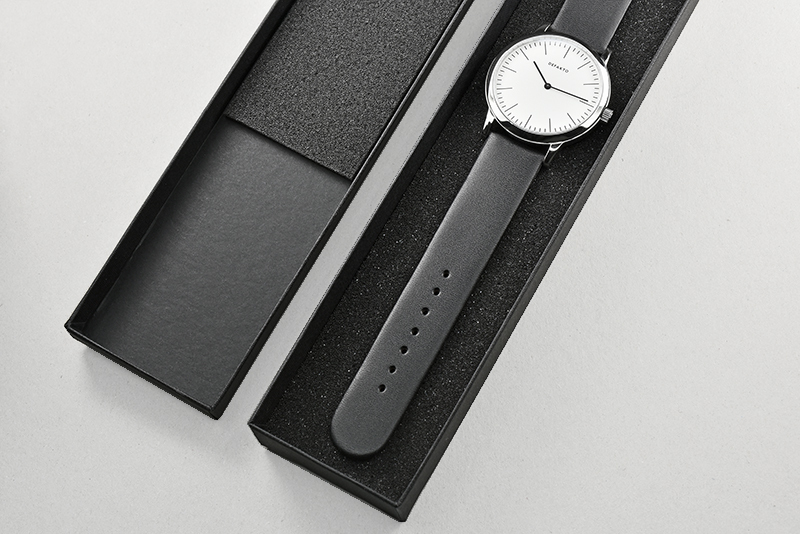 The scribed and bowed edges show architectural features and give the box its unmistakably minimalist shape. 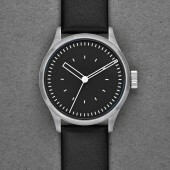 Inside, the watch is fixed to a free-floating carton by two black rubber loops. 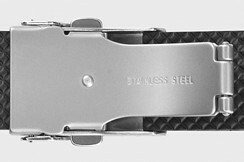 This inner system is removable from the box for better handling. 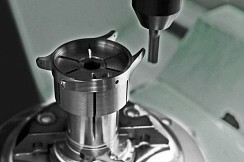 The cellastic cut on the back of the lid provides additional protection. 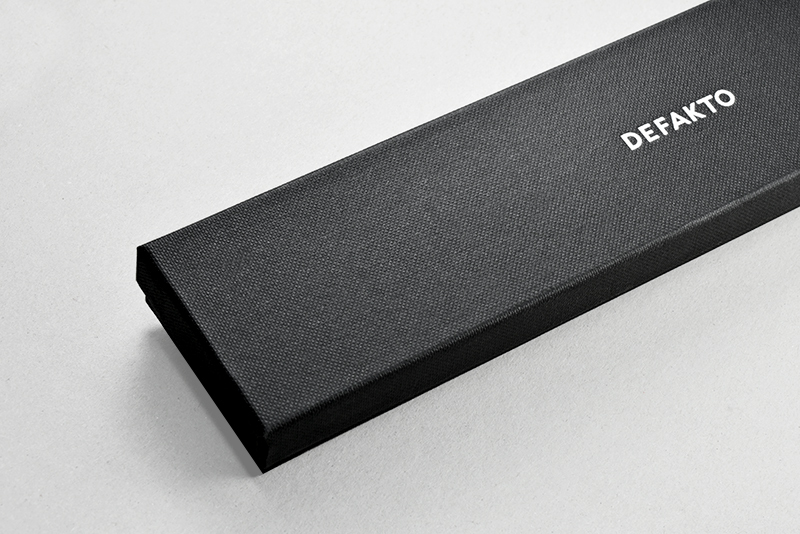 The three-piece box, with recessed, white Defakto embossing has dimensions of 280 x 80 x 30 mm. 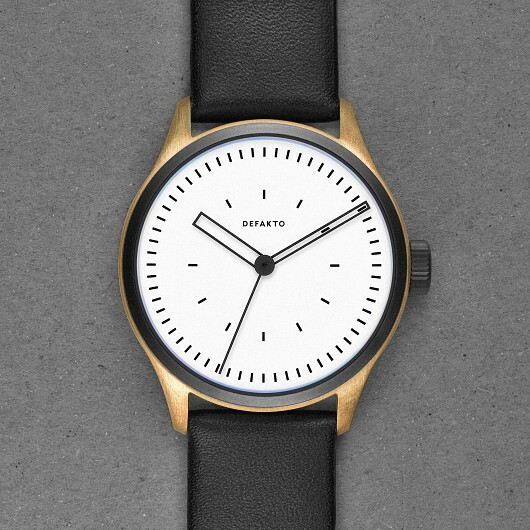 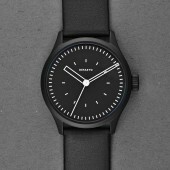 As standard, all Defakto Quartz watches come with our sleek, black, German-made cardboard box. 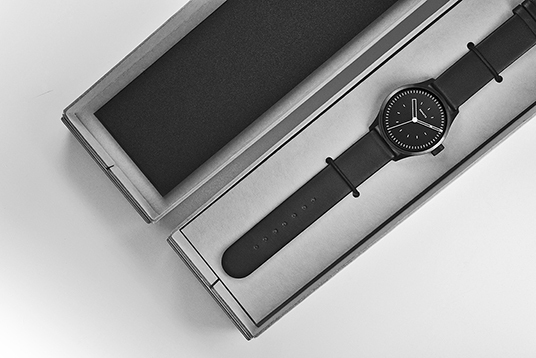 Accompanying our very flat watches Mono, Dialog and Struktur, the box is reminiscent of those of high quality knives. 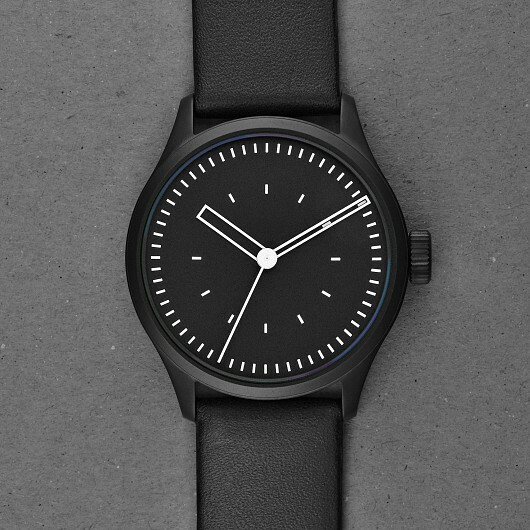 During shipping your watch is also safely embedded in black, coarse-pored foam. 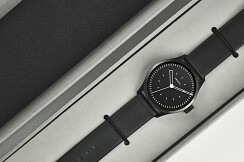 The outside of the box has a structured, matt surface and offers opulent aesthetics and haptics. 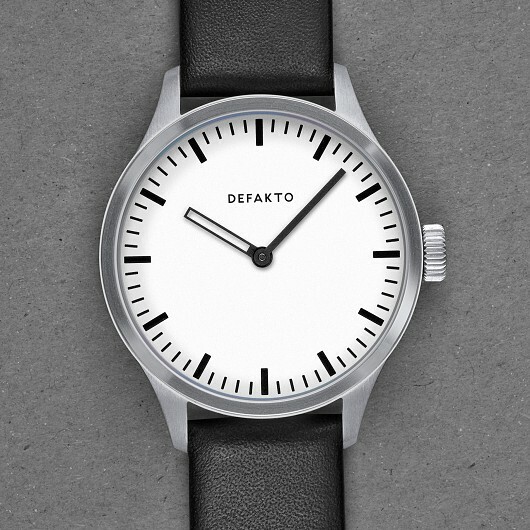 The white Defakto logo is embossed on the lid. 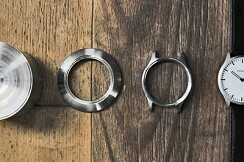 The edges of the box are slightly rounded. 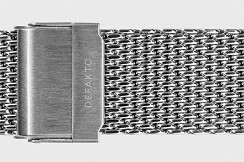 This Defakto packaging has a size of 255 x 55 x 20 mm and comes in 500 g/m2 material weight.